As we slide into the end of the summer, I have a few different fruit compotes sitting in my refrigerator that I need to use up. There’s apricot, peach and plum – so delicious served alongside cake, over ice cream or stirred into yogurt or oatmeal. I decided to use the last of my seasonal stash to create some rolls using my easy basic yeast dough recipe. 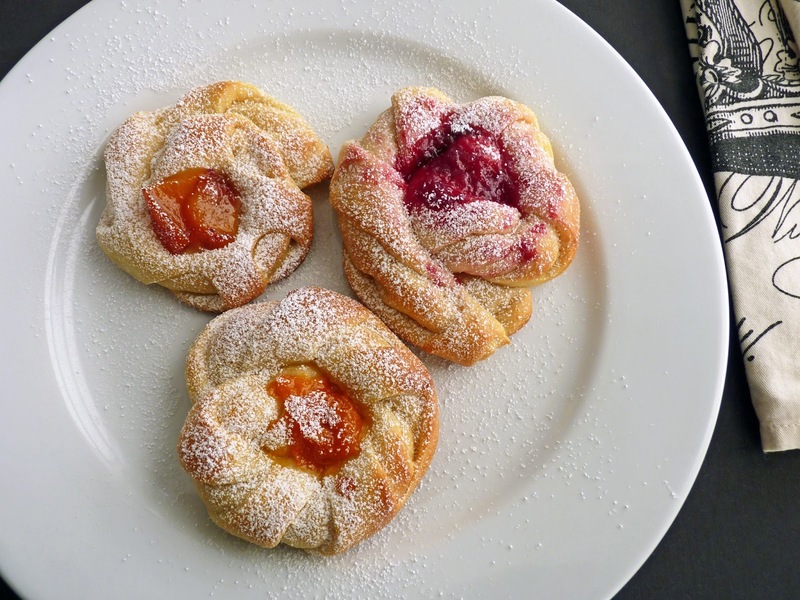 I filled the rolls with a dollop of my compote preserves and they baked to a jammy deliciousness that will make your weekend brunch just that much brighter. But you can also bake them plain to enjoy simply with butter. Sometimes the basics are all we need to keep company with our favorite morning beverage. It’s hard to believe it’s almost September but it’s been a great year for fruit, thankfully. I’m still savoring nectarines and figs at the moment, but as children head back to school and fashion turns to sweaters and boots, we’ll be into apples and pears in no time. I hope you’ve had a chance to enjoy this year’s extraordinary goodness. - Yeast feeds on sugar but yeast activity may decrease if it comes into direct contact with sugar or salt, so dissolve the yeast in water first, then add the sugar. 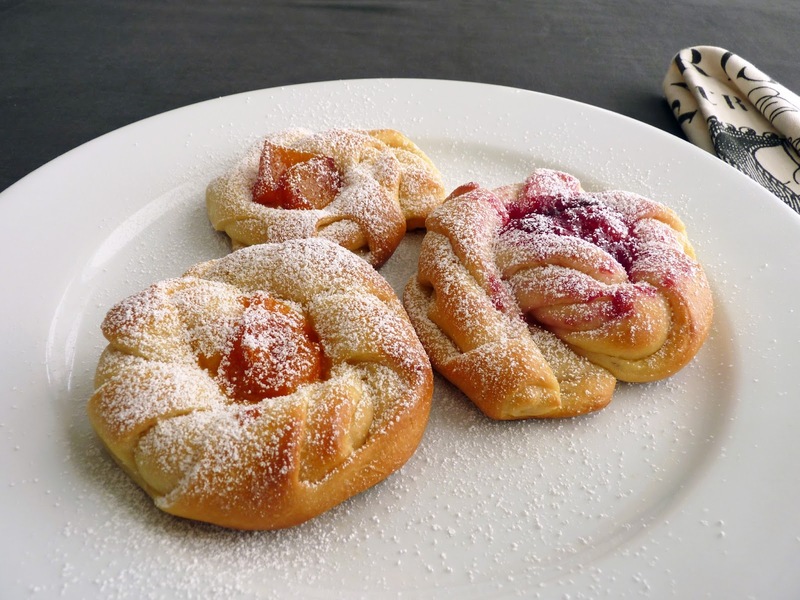 - Don’t add any more than 3 cups of flour to the dough or your pastries will be tough and dry. - As you’re forming the rolls, don’t coil too tightly so they can expand during the second rise. Here’s an illustration of how to shape the rolls. - I place each baking sheet of rolls on top of another baking sheet (“double pan”) before they go into the oven to prevent the bottoms from getting too brown. 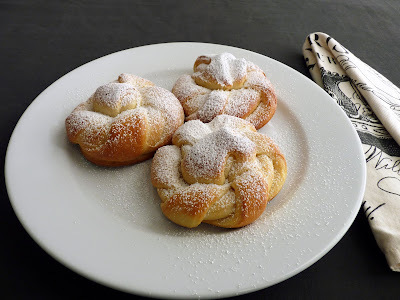 - You can dust the rolls with powdered sugar or, for a sweeter bite, drizzle with glaze: whisk together 1/3 cup (40 g) powdered sugar, 1 tablespoon milk, a couple drops of vanilla or lemon juice and a few grains salt. Whisk together 1/4 cup warm water (110 - 115 degrees F), yeast and a pinch of sugar. Set aside for 10 minutes. Place the milk, butter, 1/4 cup sugar and salt in a saucepan. Warm on low heat just until the butter is melted, whisking to combine all the ingredients. Take off the heat, add the vanilla and cool to room temperature. Combine the proofed yeast with the milk mixture. Whisk in the eggs. Switch to a fork and stir in 2 3/4 cups of flour. Keep adding 1 tablespoon of flour at a time (no more than 4) until the dough is no longer sticky. Transfer to a very lightly floured work surface and knead until the dough is soft and elastic, about 5 - 8 minutes. Wash and dry the mixing bowl and lightly grease with canola oil. Place the dough in the bowl, turning it over once to lightly coat the entire surface with oil. Cover the bowl with a piece of plastic wrap and set in a warm draft-free place to rise for 2 hours. Line two baking sheets with parchment or silpats. When the dough has completed its first rise, press down on it to release the air. Divide the dough in two equal pieces and transfer one piece to a lightly floured work surface. Dust the dough very lightly with flour. Roll out to a 12" x 16" rectangle. Brush off any excess flour and cut into six 8” x 4” rectangles. Cut diagonal slashes about every 1/2” in each piece. Loosely roll up each piece into a log and then form each log into a coil, tucking the tail underneath. Place the six rolls on a baking sheet. Repeat with the second piece of dough. If you’re adding fruit preserves, press your thumb down into the center of each coil and place a tablespoon or so into the indentation. Set the baking sheets in a warm place for 1 hour. When the rolls are just about finished with the second rise, preheat the oven to 350 degrees F.
Prepare the egg wash and lightly brush each roll. (You won’t use all the egg wash.) Place each baking sheet on top of another baking sheet (double pan) and bake until the rolls are a golden brown, about 20 -25 minutes, rotating them front to back and top to bottom about halfway through. Remove from the oven and place the pans on a wire rack to cool. Dust generously with powdered sugar. If you’ve ever loved Fudgsicles, you’re going to really love this sherbet. 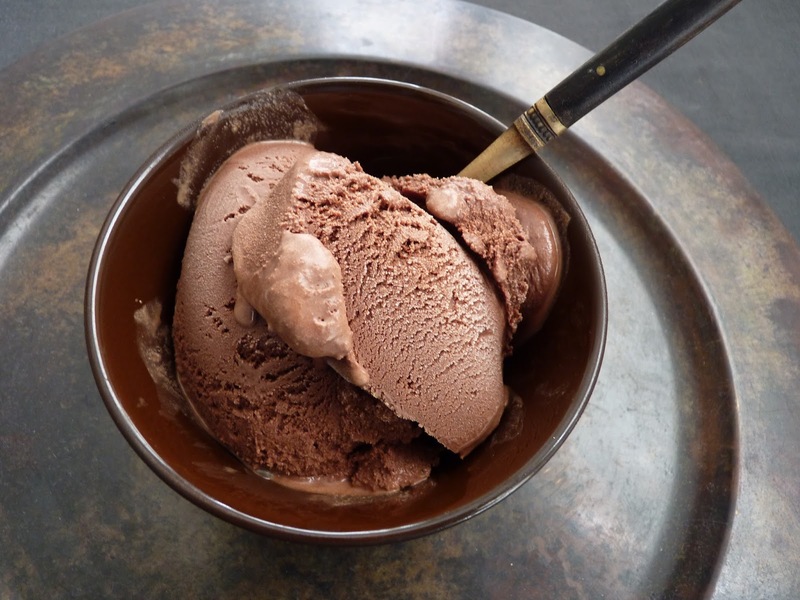 Although it’s served in a bowl rather than on a stick, you will no doubt quickly devour the creamy, chocolatey awesomeness of this scoop. 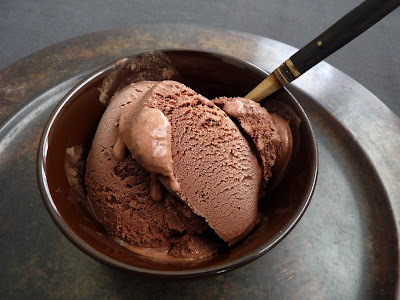 With no eggs and not a whole lot of cream, this doesn’t quite have the richness of chocolate ice cream but it does have more than a ton of flavor. It has a good dose of both chocolate and cocoa, so it’s fudgey without being too heavy and it's smooth without coating your palate. I think it's perfect. For those who really cherished Fudgsicles as a kid, this is a super delicious trip down memory lane, only much, much better. I promise, a bowl of this sherbet will fire up all your best chocolate neurons. And as today marks the 8th anniversary of my blog, I can't think of a better way to celebrate! - I used natural undutched cocoa powder. - 6 oz of chocolate is 1 cup chopped. For the best flavor and texture, please do use a block of chocolate, not chocolate chips. - The cornstarch helps to inhibit ice crystal formation. - A pinch of cinnamon is added to give just a bit of depth. 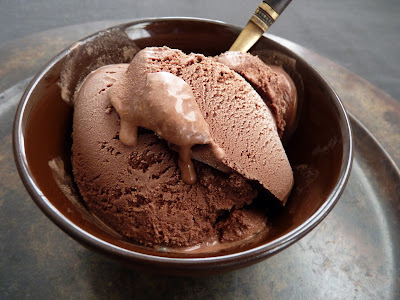 - For another adventure in extreme chocolate bliss, try super deluxe Mexican Chocolate Ice Cream. Finely chop the chocolate and place in a heatproof bowl set over a pan with about 1" barely simmering water. Melt the chocolate, stirring until smooth. Take off the heat and set aside. Place the cocoa, both sugars, cornstarch and salt in a saucepan. Add about 3/4 cup milk and whisk until smooth. Whisk in the remaining milk. Bring to a simmer over medium heat, stirring constantly. Cook for about 2 more minutes. Take off the heat and whisk in melted chocolate, heavy cream, vanilla and cinnamon. Taste and adjust for salt, adding a few grains at a time. Cool. Pour into an airtight container and refrigerate until thoroughly chilled, preferably overnight. Freeze in your ice cream maker according to the manufacturer’s instructions. Pour into an airtight container, press a piece of plastic wrap into the surface, cover and place in your freezer to firm up. As we inch toward September and the winds of fall, I’m here to remind you to be sure not to let the chance to make a fresh fruit galette pass you by. In my opinion, fruit galettes are a must have every spring and summer. A free form version of pie, they are much easier to make and one of the most delicious things you can eat during our fabulous fresh fruit season. Nothing really beats the contrast of buttery, crisp and flaky pastry and the sensation of pampered fruit. 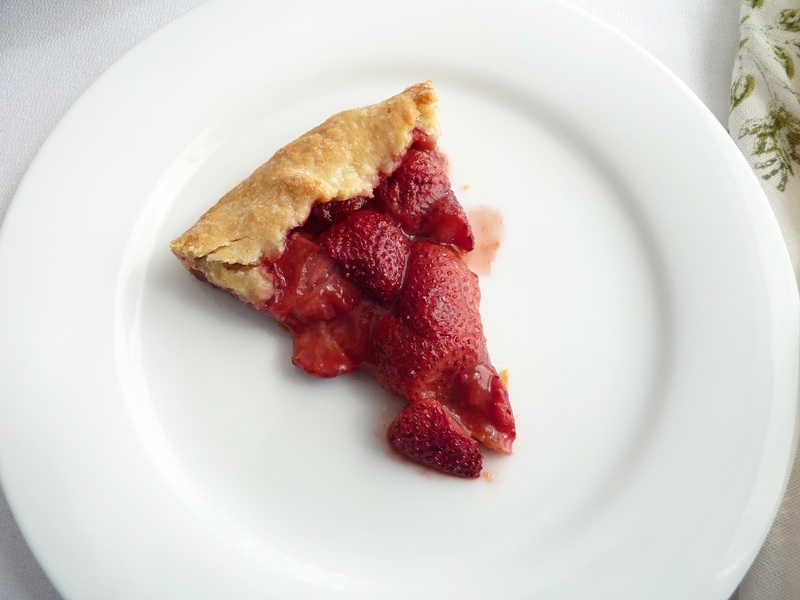 At the renowned Chez Panisse in Berkeley, fruit galettes have always been central to their daily dessert menu at the upstairs café. When I interned there, I saw some of the very best fruit produced in the country float through the door. Just amazing color, texture, taste. So I clearly understood how much this dessert is beloved by their patrons and so very rightly so. One of the basic components for assembling the galettes at Chez Panisse is what they call “moon dust,” a simple mixture of equal parts almonds, flour, sugar and pulverized amaretti. 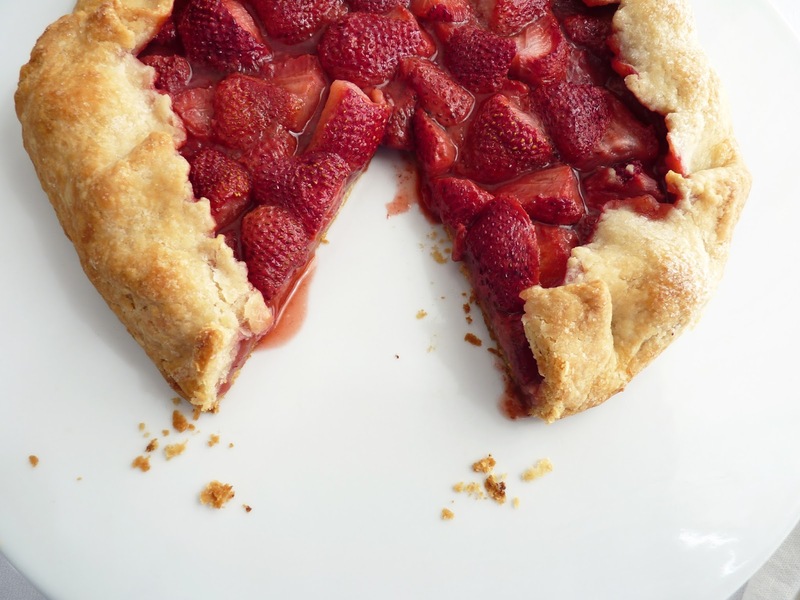 These ingredients are ground in a food processor and sprinkled on the pastry dough before the fruit is arranged on top. 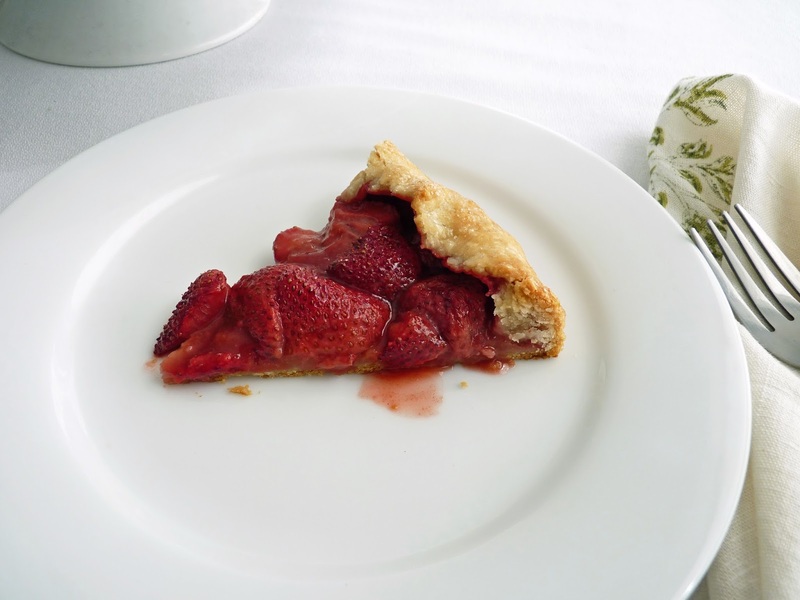 This layer of moon dust prevents the crust from getting soggy and adds a subtle almond note to the finished product. Although I really love the fall season, I’m not quite ready for the shift. There will be plenty of time for chocolate and nuts, apples and pears. But for now, if you can locate some delicious fresh peaches, nectarines, apricots, figs or plums, don’t let them pass you by. I happened to have some strawberries. 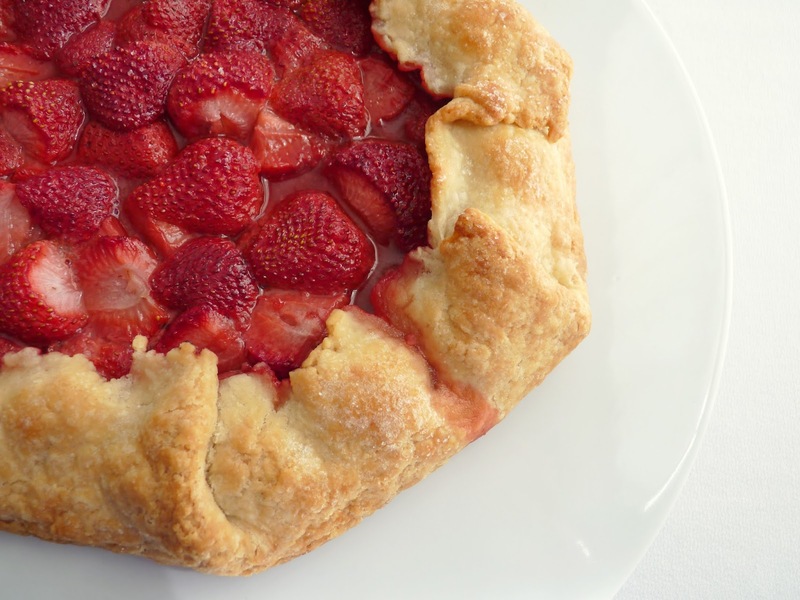 Whichever fruit you choose, it’s a delicious pastry to close out the summer. - It’s very important that the butter and water for the pastry dough are very, very cold. If the butter is warm or soft, it blends too much with the flour and there won’t be the pockets of butter necessary to produce flakiness. - The finished dough will look like a pile of small bits similar to cottage cheese. Resist the temptation to knead it, which will toughen it. Just place the pile on a sheet of plastic wrap and pull it together as you wrap it tightly. As it rests in the refrigerator, it will all come together. - So why chill the dough after mixing? Because it allows the gluten in the flour to relax (which means the dough won’t spring back when you go to roll it out), the water to be fully absorbed and the butter to firm up. - I like to roll out my dough on a silpat or piece of parchment so I can lift the whole thing onto the baking sheet without stretching or tearing the dough. - Mix the fruit and sugar just before you're ready to assemble the galette. If it sits too long it will begin to macerate and you'll have too much of the juices flowing. - Amaretti are traditional almond flavored crunchy cookies from Italy. They’re made from noyau, the kernel found inside the apricot pit (almonds and apricots are botanically related). If you don’t have access to amaretti, use another almond cookie you love. - You can make a larger quantity of moon dust and store it in an airtight container. To prepare the galette dough, place the flour, sugar and salt in the bowl of a food processor and blend. Cut the cold butter into 1/2” pieces and add to the flour mixture. Pulse until the butter is the size of small peas. Add the cold water and pulse just until the dough starts to clump. The dough will not look smooth but rather clumpy and a bit like small curd cottage cheese. Gather the mixture and place on a sheet of plastic wrap and wrap tightly. Shape into a flattened disc and chill thoroughly. For the moon dust, place all the ingredients into a food processor and process until finely ground. Pour into a bowl and set aside. When you’re ready to roll out the dough, unwrap and let it rest on a lightly floured piece of parchment paper or silpat for just a few minutes. It needs to warm up just enough to handle without a lot of resistance and cracking. Roll the dough out to about a 12” circle and 1/8” thickness, gently lifting and moving the dough after each roll and keeping it lightly floured as needed. When you have the desired shape, brush off any excess flour and lift the dough along with the parchment or silpat onto a baking sheet. Chill while you prepare the fruit. Hull and slice the strawberries in half and place in a bowl. Toss with 3 tablespoons of sugar, to taste. Remove the prepared dough from the refrigerator and sprinkle 1/4 cup of the moon dust evenly across the pastry, leaving a 1 1/2” border around the edges. Arrange the fruit on top of the moon dust. Lift and gather the edges up and over on top of the fruit, being careful not to create any cracks that will cause the galette to leak. Work your way around the circle with both hands, pleating and pressing gently to keep the dough in place. Chill if the oven isn’t ready. Brush the border of dough with melted butter and dust with a light sprinkle of sugar. Bake until the dough is crisp and browned and the fruit is bubbling, about 40 minutes. Although chocolate all on its own is a powerfully soothing bite, I also like the combination of chocolate and fruit. When the acidity of both is in balance, I think it works beautifully. I think this is true for raspberries, strawberries, bananas, apricots, figs, cranberries and cherries. Cherries have been really good this season - sweet, juicy and plentiful. 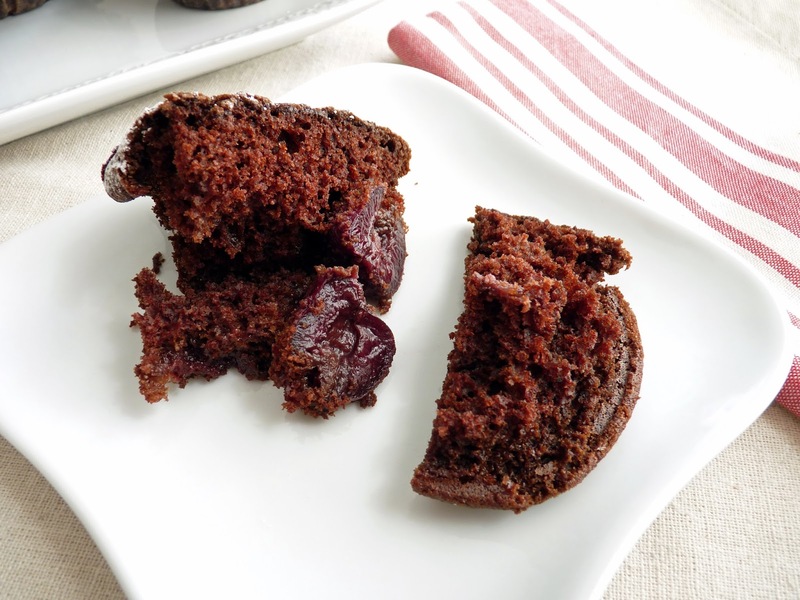 So I decided to use part of my stash to turn out some simple chocolate cupcakes with a buried treasure of cherries. The cherries are simmered for just a few minutes to soften them up and to flavor them with some spice for extra intrigue. 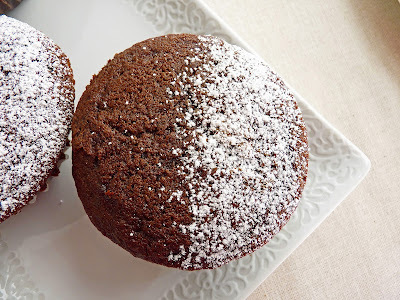 The cupcake is tender and enriched with the depth of cocoa. So simple and so irresistible. If you're a fan of chocolate cupcakes - and really, who isn't - I think you'll find this combination a worthy one. - I sometimes like to use star anise with cherries. Just a couple of points from a star are plenty in this compote to give them a nice twist. The cherries can be made a day or two ahead. Place in an airtight container and chill until ready to use. - I first tested this recipe using cake flour and I absolutely loved the results. But the cupcakes were super tender and didn't hold together very well. So all-purpose flour will add a bit more strength to the texture. But try cake flour if you don't mind the extra tenderness. - Since these cakes are very tender, I recommend using paper liners to avoid trying to wrestle them out of the pan. Lightly greasing the rim circumference of each well will also help ensure the tops will loosen easily. - The high ratio of sugar to butter in the cake recipe requires you to cream the mixture for about 5 - 6 minutes on medium speed until it is light in color and fluffy in texture. It starts out grainy, then turns into small clumps, then lumps into a ball and then eventually smoothes out to a cohesive fluffy mixture. At first you’ll wonder how it’s ever going to come together but it will. Honest! - Drain off the juices before placing the cherries in the cupcake batter (I placed 2 at a time). 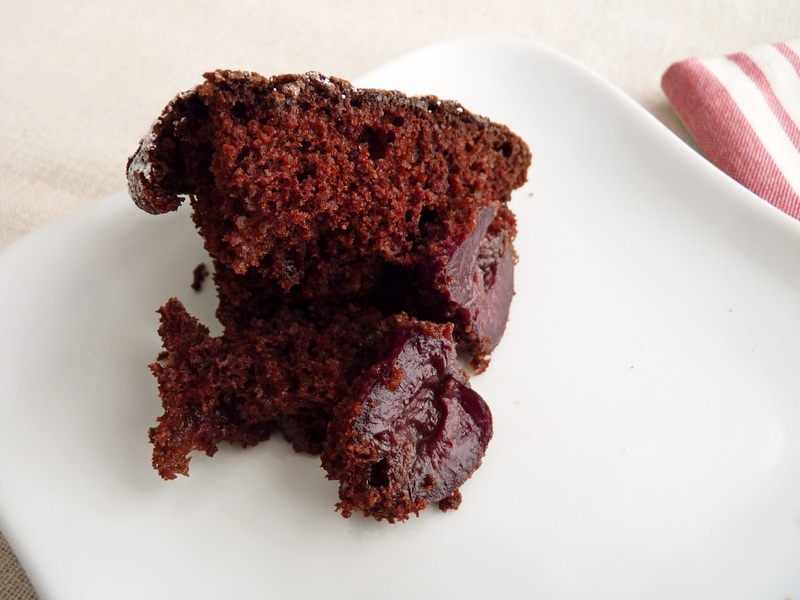 The cherries should still be moist but you don’t want the batter to get soupy. Use the drained syrup and any extra cherries to flavor oatmeal or yogurt. For the cherries, stem and pit them and place in a saucepan. Add the sugar, cinnamon and star anise and simmer, stirring occasionally, until the fruit begins to soften, about 3 – 4 minutes. Take off the heat and cool. When ready to use, discard the star anise. Preheat your oven to 350 degrees F. Line a standard cupcake tin with paper liners. For the cupcakes, sift together the flour, salt and baking soda. In a separate bowl, whisk cocoa and hot water together until thoroughly blended. Cream butter and both sugars until light and fluffy, about 5 - 6 minutes on medium speech in a stand mixer (see the fourth bench note above). Stop and scrape down the bowl at regular intervals. Add eggs one at a time and blend well before adding the next. Scrape down the bowl. Add cocoa mixture and vanilla and combine thoroughly. Add the dry ingredients in 3 additions, alternating with half the milk and beginning and ending with the dry ingredients. Stop mixing just before it is fully blended and finish by scraping the bottom of the bowl and folding with a rubber spatula until there are no streaks. Distribute equally into the prepared cupcake liners. Submerge 2 drained cherries into the batter of each cupcake. Bake until a toothpick tests with a few moist crumbs adhering, about 20 to 22 minutes. Cool 10 minutes. Run a thin bladed knife around the edges to loosen and turn out the cupcakes. Cool completely.